It is a registered fact that the military conducted the affairs of Nigeria for about 16 years, 1983-1999. During this period, Nigerians felt frustrated. They expressed their anger for not being treated fairly as citizens of the country by the military. They groaned, and there were agitations and protests in virtually every part of the country. To change the narrative, they demanded for a democratic system of government which was actualized in 1999 after a keenly contested general election. The 1999 Presidential election was won by former President Olusegun Obasanjo of the Peoples Democratic Party (PDP). He ruled from that time till 2007, and handed over to late President Umaru Musa Yar’ Adua, of the same party, who unfortunately died in 2010 after a protracted illness. After Yar’Adua’s death, the then Vice President, Dr. Goodluck Ebele Jonathan, took over and completed his tenure. In 2011, Dr. Jonathan contested for the position and won. He ruled from 2011 to 2015. We can understand that the PDP ruled the country from 1999 to 2015, 16 unbroken years. Its problem started when the former President, Dr. Jonathan, was trying to go for a second term. That was in 2015. A large number of Nigerians, who believed that the party was not doing well, teamed up against the party. They blackmailed Jonathan and the party to the brim, and also applied other measures. Actually, many Nigerians were against the PDP and its candidate, but what weakened the PDP was the coming together of some political parties. The leaders and stakeholders of those political parties quietly dropped their individual interests and formed a coalition which metamorphosed to a platform better known as the All Progressives Congress (APC). They aimed at using the platform to wrestle the ruling party to the ground which they achieved at the end of the day, as the APC Presidential candidate, Muhammadu Buhari, defeated former President Goodluck Jonathan of the PDP in the 2015 contest. This was how the PDP lost out. Obviously, many Nigerians felt that the PDP government was corrupt and insensitive, and called for change of government. On noticing the feelings of the people, the APC quickly adopted a “change” mantra which helped them to capture the mind of many Nigerians. They promised to take the country to a greater height, stabilize the economy, improve on its security, provide infrastructural facilities and many other things. But unfortunately since the past three years the APC took over power, nothing serious has been done to promote the image of the country and also improve the living standard of the people. The economy has collapsed, the security situation is nothing to write home about, as people are being killed on daily basis. In all, no sector is working under the President Buhari administration, meaning that the APC has failed to fulfill its campaign promises. The party failed to the extent that a greater percentage of the electorate are calling for its removal in 2019. The truth of the matter is that the failure of the APC-led government has provided an ample opportunity for the PDP to rise again. 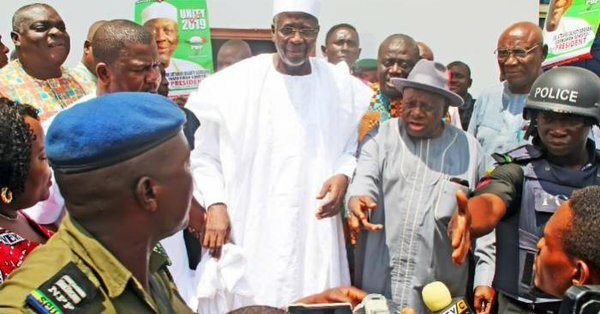 The PDP stands better chance of taking over power in 2019, as the majority of the electorate who voted the party out in 2015, are calling for its return in 2019. However, with this development, the PDP leadership and stakeholders should rise to the challenge. They have to wake up and understand that their fortune in 2019 lies in their hands. They should also understand that the role they play now will determine their future, as the electorate are not only watching them, but also waiting for them. They are looking forward to seeing the PDP coming up with a credible candidate, a candidate that has the capacity to defeat the ruling APC in 2019. The question remains, who, among the litany of Presidential aspirants in the party has the capacity to give it victory in 2019? This question appears to be very difficult to answer, but to political watchers and analysts, it is very simple, in the sense that they know the politicians, their antecedents and political credentials, which are among the major factors to be considered. Really, a good number of the Presidential aspirants in the PDP are capable of giving the ruling party a straight fight. One cannot dismiss this claim with the wave of hand. But, a critical look at the situation shows that Alhaji Attahiru Bafarawa, the former Governor of Sokoto State, has brighter chances. He has better political credentials, the type that can easily lure the electorate into submission. His unbeatable and intimidating profile has already created a good impression about him, the impression that he will do well if given the opportunity to serve as president of the country. From what I gathered, Bafarawa is the kind of leader that thinks less of himself and more about his people. His emergence as president of Nigeria will definitely usher in democratic values that will accelerate unprecedented development in the entire country. Let’s draw examples from what he did when he was the governor of Sokoto State. He served for two terms. Within his first tenure, he completed more than 1000 kilometers of roads. Obasanjo, who was then President of the country was so amazed when he visited Sokoto State. He christened Bafarawa “Road master” in appreciation of a good work. Unarguably, one of the major problems facing the country today is bad roads. Virtually all the Federal roads in the country are in a state of dilapidation. The problem stems from the inability of our leaders or those in power to effect positive changes in society. They don’t feel affected over the sufferings of the people they are ruling. So, for Bafarawa to fix over 1000 kilometers of roads within four years, simply means that the story of bad roads will become a thing of the past if he takes over the leadership of the country. He will take it as a priority and ensure that the dilapidated Federal roads in the six geo-political zones of the federation are reconstructed to international standard. As a servant-leader, Bafarawa opened up Sokoto State from a rural capital to a truly urban one, thereby making the city a cynosure of all eyes. Above all, Bafarawa is largely known as a good manager of resources. He believes in prudent management of resources. The people of Sokoto State know this. By the time he was leaving office in 2007, that was at the time many governors were leaving their states with a huge debt overhang, but Bafarawa left N12 billion in the coffers of Sokoto State. With the above, one can easily understand the stuff the Sokoto State-born politician, Bafarawa, is made of. It shows that he is not only a performer, but also a lover of his people. These rare qualities have made him more popular in Nigeria, as people from every part of the country are backing his presidential ambition, knowing full well that he will replicate what he did in Sokoto State in the entire country if he becomes the president in 2019. Strictly speaking, Bafarawa is a presidential material. He possesses all the notable imprints of an accomplished leader, and he remains the strongest contender to beat any candidate pro- duced by the APC in 2019. It is a fact because among those jostling for the position, he is the only one accepted by people from the six zones of the country. What earned him this is the kind of politics he plays. Unlike others, he presents himself as a detribalized Nigerian, thereby promoting peace and unity in the country. Of course, the cause of the major problems in the country today is religion and tribal sentiments. These have affected the progress of the country to a large extent, so any Nigerian, particularly a candidate of a political party that tries to shun such lifestyle the way Bafarawa is doing, will definitely be appreciated by Nigerians. Again, from what we are seeing, Bafarawa has what it takes to win the 2019 presidential election if given the ticket. He is one man that enjoys the support of his people. It is interesting to note that the people of Sokoto State and North West where he comes from, are strongly rallying round him. However, with the present condition of things, Nigeria does not require just anybody as president. It requires somebody with sound profile, who has the capacity to turn things around within a given time. And from what we have seen so far, Bafarawa is the only aspirant in the PDP that has the needed qualities. He stands tall among all. If given the ticket, he will spring surprises. Buhari doctrine or universal principle?